long weekend in north conway. Over the long weekend my family celebrated my mom’s 60th birthday in North Conway, New Hampshire. Growing up, my mom’s family used to rent houses in New Hampshire and Vermont for ski getaways at least once every winter. As we’ve all grown up and kids have become adults, this tradition became a lot more difficult to keep up and we probably haven’t all been away together in about 15 years. I took on the planning of this weekend and I was so happy that everyone was on board. I had heard a lot of good things about North Conway and the town did not disappoint. The town’s center has a lot of little shops and restaurants that I wish we could have had more time to spend exploring. One of my favorite parts of the weekend was snowshoeing for the first time at Peaked Mountain. It was snowing the whole time we hiked and really looked like a winter wonderland. On Sunday I went skiing at Cranmore Mountain but the conditions were pretty icy since there hasn’t been a ton of snow this winter. Luckily there’s always the lodge! Here are some photos I took throughout the weekend. Enjoy! Here are a couple photos of the house we rented. This home was perfectly situated between the mountain and the town. Super cozy with two fireplaces. It was a great place to stay with a large group. This was the house next door but I had to get a picture because of loved its retro chalet vibe. But the view was still beautiful. 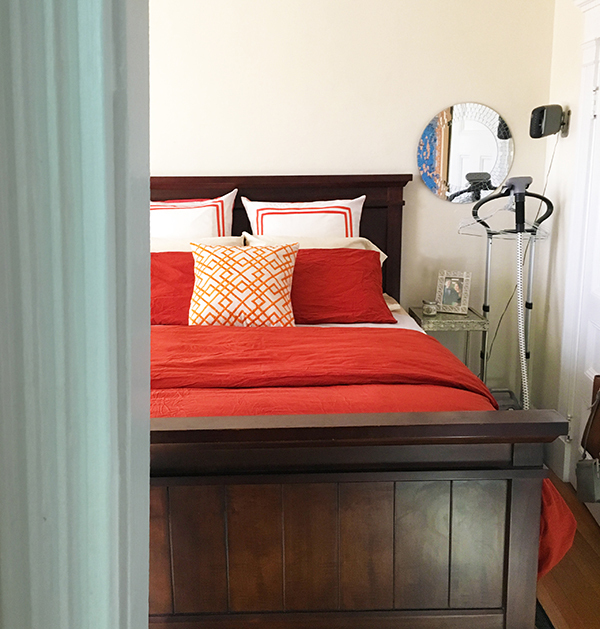 If you saw my previous post about cohabitation and you may have noticed that I didn’t include any photos of my bedroom in the sampling of images of our apartment. At the time the bedroom was still a work in progress and I didn’t want to share anything until I felt more satisfied with the way it looked. 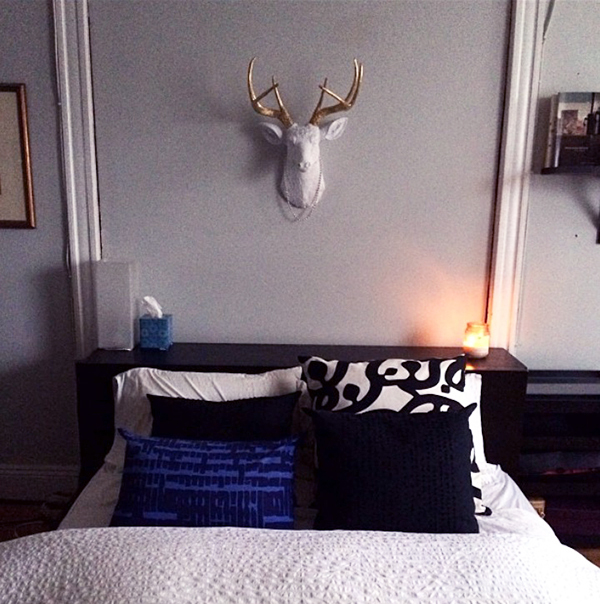 Since that post we’ve made some upgrades to our bedding and a couple décor items, which I think have elevated the feel of the room in a great way. Part of the reason this room took a little longer than the rest is because it was a complete departure from the way I’ve approached decorating my bedroom in previous apartments. As I’ve mentioned in other posts, Jared and I are living together for the first time in this apartment so the merging of personal styles has forced me to negotiate our shared space in ways I’ve not had to think about before. My personal tendency in terms of color palette has always leaned more toward cool tones, while Jared favors vibrant reds and oranges. To illustrate this, here is an image of my bedroom in a prior apartment where I lived with roommates. 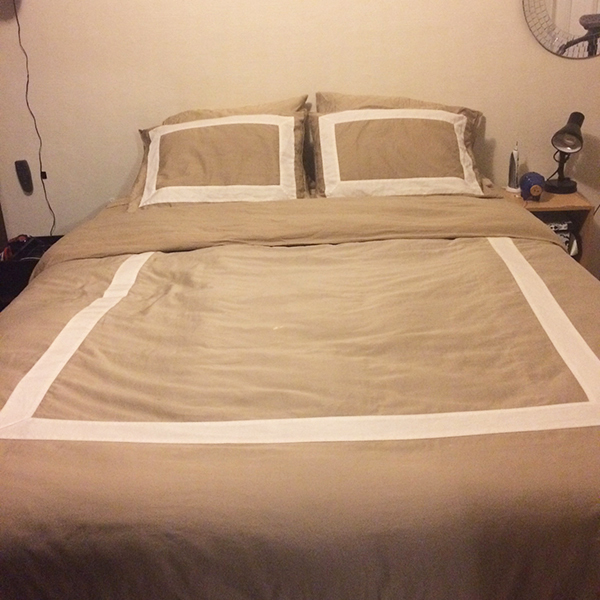 When we moved in together I didn’t take my old bedding with me because it was several years old and beginning to show some wear. 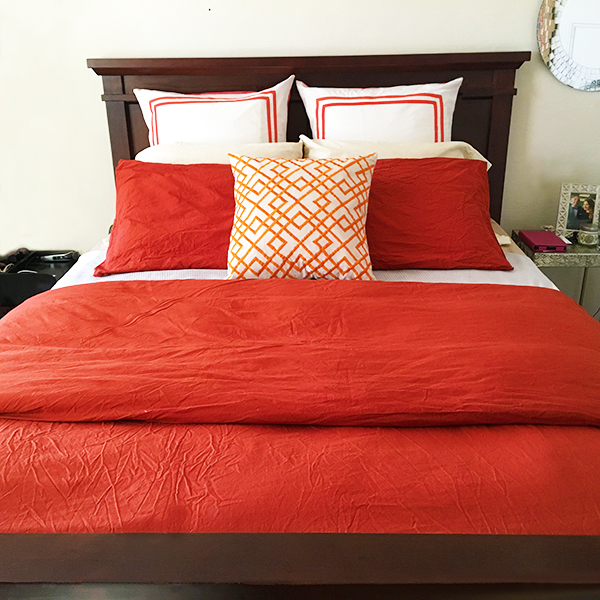 Initially we threw Jared’s existing bedding on the bed, without any frame or headboard, while we focused on unpacking and decorating other rooms. 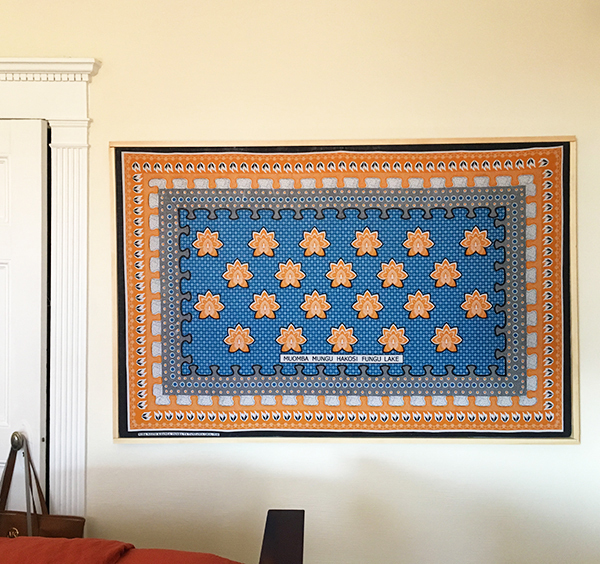 When we finally got around to this room I knew that we would be hanging a very bright, mostly orange tapestry that Jared had bought on a vacation in Zanzibar years ago. Aside from the personal preference of my boyfriend, I didn’t think it would make sense to go with my typical cool blue/grey palette in this room when our most prominent piece of artwork didn’t really fit into that aesthetic. we framed this ourselves with directions from this tutorial.